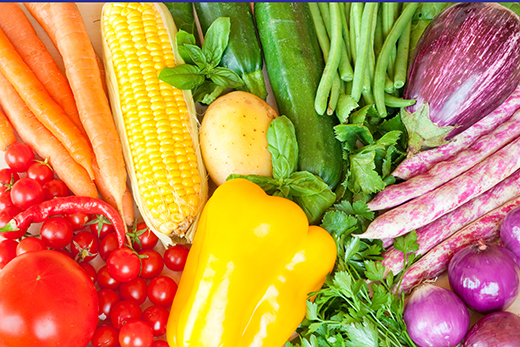 Emory’s Colorful Choices nutrition challenge is back, with registration open until March 24. Participants track their daily intake of fruits and vegetables for the six-week program, starting March 27. March marks the start of spring, when foliage pops with a rainbow of color and the growing season returns for many fruits and vegetables. What better way to celebrate nature’s bounty than with a nutrition challenge that promotes healthy eating and a diverse palette on one’s plate? Luckily, Healthy Emory’s Colorful Choices is back, with registration open until March 24, and the six-week challenge starting Monday, March 27. The challenge works much the same way as last year’s challenge. Participants track their daily intake of fruits and vegetables, earning points for each serving they consume, with the goal of eating at least five servings of produce each day. Vegetables earn participants two points, while a fruit serving equals one point. Ideally, participants would earn eight points per day, with six of the points coming from vegetables. Participants are encouraged to select options from across the spectrum of colors, as each of the colors of the rainbow are associated with different concentrations of important nutrients and phytochemicals. For example, the red tomato is packed with lycopene, an antioxidant that can help the body fight off heart disease and various cancers. For those who aren’t tomato fans, you also can get this disease-fighter from watermelon and apricots. Likewise, while dietitians often encourage the consumption of leafy greens and cruciferous vegetables, such as broccoli and kale, you can still benefit from the anti-inflammatory effects of chlorophyll-rich foods by eating green apples, kiwis and honeydew melons. To help people explore new foods and find different ways to make produce tastier, the Colorful Choices website offers dozens of easy recipes to boost creativity in the kitchen. Colorful Choices also offers a mobile app to make it easier to track your produce consumption while on the go. Those who achieve certain benchmarks throughout the six-week challenge will be entered into a drawing to win gift cards ($25 and $50 value). In addition, a weekly winner will be drawn from all active participants (regardless of point total accumulation). For those wanting to take their nutrition to the next level, Colorful Choices has a list of “Top Choices.” These foods are especially nutrient-dense and lower in calories. Eating from the list earns participants an additional bonus point. Registration for Colorful Choices continues through March 24 and the challenge is open to all faculty, staff and retirees. For more information and to register, visit the Colorful Choices webpage. The Healthy Emory Colorful Choices team wants to hear from you! Create or make a recipe that involves four or more ingredients from the Top Choices list, take a picture of your creation and email it and the recipe (with information on the source recipe if not your own) to healthyemory@emory.edu. We’ll post the submissions on the Colorful Choices page.